One of my favorite things about having this blog, is that it forces me to delve into my recipe archives to find the next great thing to cook. 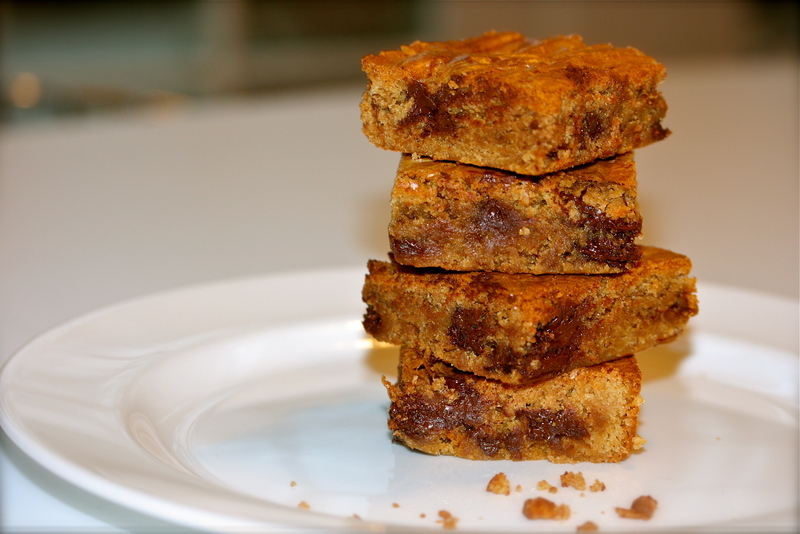 On my latest rummage session through some old recipe cards, I found this blondie recipe. When I was a manager for Williams-Sonoma many years ago, there was a woman who worked at the store named Shonda. She was a trained pastry chef. I can remember the decadent treats she would bring the staff to try. 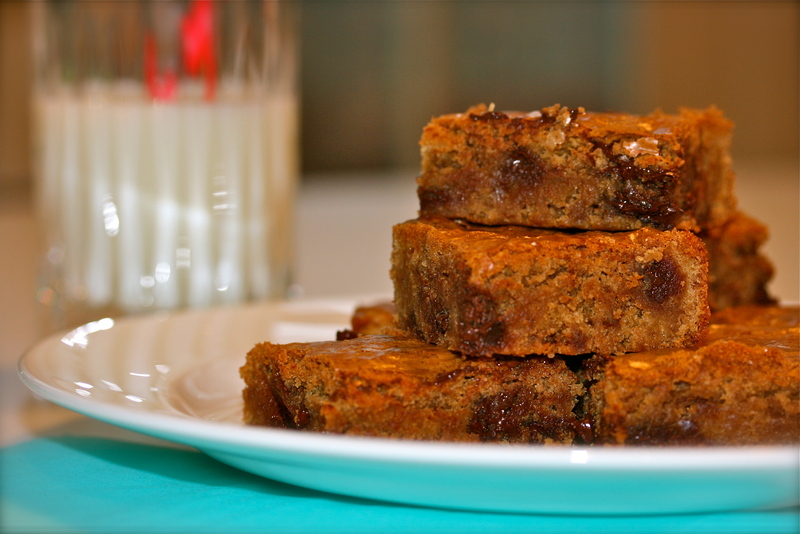 She was nice enough to share this blondie recipe with me, and I was lucky enough to find the recipe card. I have no idea where Shonda is today. The last time I saw her was almost 20 years ago. I hope she is well and still baking! Maybe she’ll stumble upon this blog one day and see this tribute to her famous blondies. There’s nothing healthy about this dessert. They are rich and full of butter, but oh so good! * I used 2 Ghirardelli 4oz bittersweet bars of chocolate. Preheat the oven to 350 degrees. Butter a 9×13 brownie/cake pan. I line the bottom with parchment paper, buttering the paper as well. Put the flour, baking powder and salt in a bowl and set aside. Melt the butter in a large (4qt) saucepan. Add the brown sugar and stir until completely combined with the melted butter and it begins to bubble. Remove from the heat and allow to cool for about 15 minutes. Using a wooden spoon, stir the beaten eggs and vanilla into the saucepan with the butter and sugar. Stir fast to help prevent your eggs from scrambling. Add the flour mixture and stir until it is just combined. Stir in the chopped chocolate and quickly transfer the mixture to the prepared baking pan and smooth the top. Don’t stir it too much when you add the chocolate, you don’t want it to melt completely through the batter. Bake in the 350 degree oven for about 25 minutes or until a toothpick comes out clean. I generally bake on the convection setting in my oven, so these were done for me in 20 minutes. Allow to cool for one hour before serving. Yum! I remember these and they are outrageously delicious! And even better – I’ve seen Shonda!! I will make sure she knows about this blog if I run into her again. 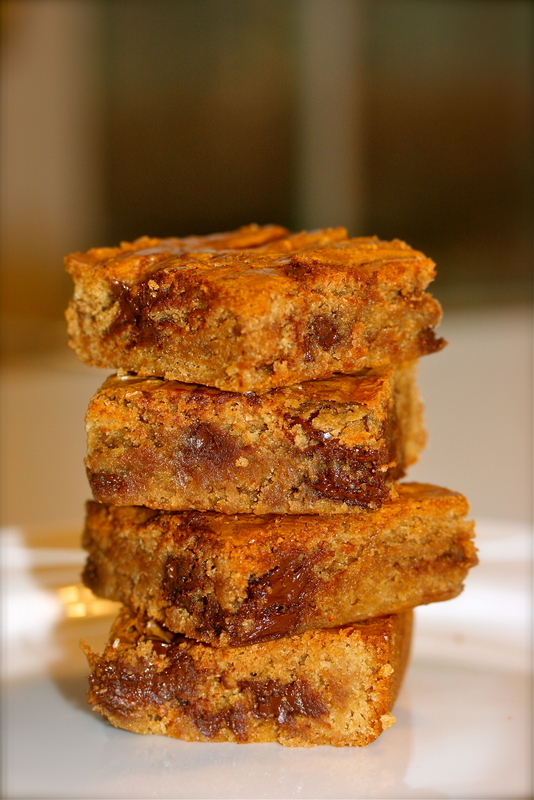 And in the meantime I’m going to make a batch of these blondies! I knew you’d remember Shonda and the blondies! Please tell her I was thinking about her. Make lots of these… they’re so good!